The Bandara Polonia Medan or Polonia Airport in Medan is the airport that served International and domestic flights in and out of the city of Medan. When my plane landed on the airport, there was no aerobridge available. So to alight from the plane, everyone had to use the stairs to walk down to the tarmac of the airport. Then the passengers had to walk from the tarmac to the arrival hall. The arrival hall reminds me of the time of old airport that was built in the early 1980s – small, very simple and basic facilities. I had read that Medan is currently in the process of building a new airport for their city, which is definitely the right thing to do. You have to walk on the tarmac from the plane to the arrival hall. The Customs and Immigration clearance in the Polonia Airport was surprisingly quick and efficient. There is a counter specifically for those passengers who need to purchase Visa on arrival and then a few counters opened to clear the immigration process. There were some passengers who needed to have their fingerprints scan on a compact scanning machine; and there is a camera mounted on each immigration counter to have the photo of travelers taken. The whole process of immigration clearance took less than 15 minutes and I am out of the airport arrival hall. The conveyor belt for the luggage is a very short one. Do pick up your luggage as quickly as you can and do not allowed any stranger to help you with your luggage. Just hold on to your luggage and walked to the custom clearance counter where your luggage would be scanned in the machine. After I had walked out of the arrival hall, I had to face a continuous harassement by touts. These touts would asked me where I am going and do I need a taxi? I simply walked to the nearest cafe and sat down for a drink. It gave me an opportunity to observe the entire area outside the arrival hall and at the same time enjoying a delicious avocado fruit juice or called apokat juice in Indonesia. The Polonia Airport in Medan is an old airport with basic facilities. 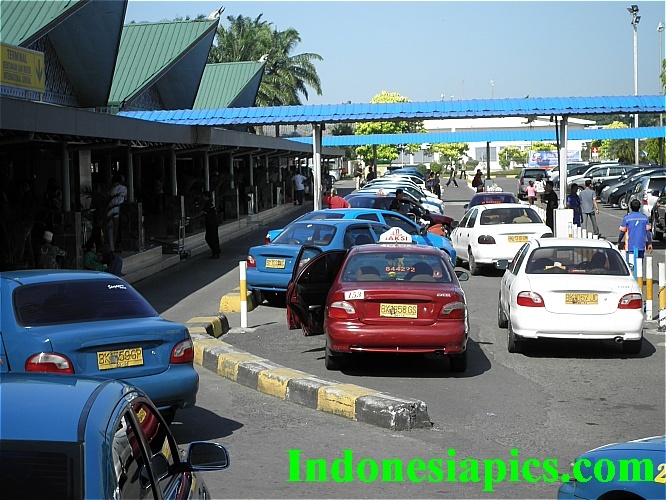 There is two ways to take a cab from the Polonia Airport in Medan to the city. First, I had a choice to take a taxi by going to the taxi counter outside the arrival hall and the charges was steep for a ride to my hotel in Jalan Surabaya – which was Swiss Belinn Medan. I was quoted a fee of Rp55,000 and was non negotiable. The second option was to walk out of the airport itself and go to the Petronas Petrol staion. 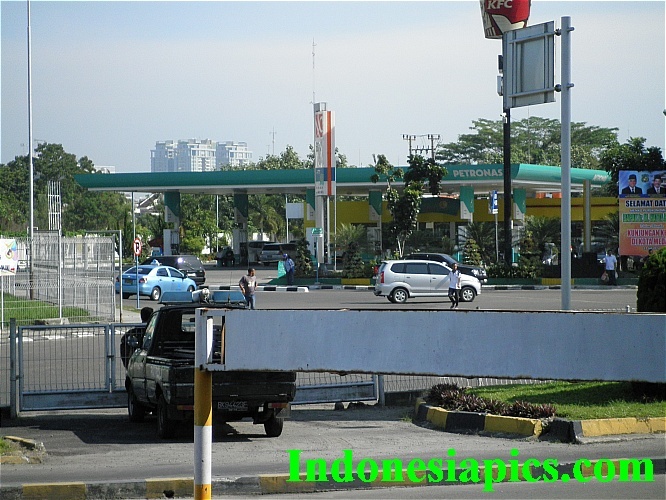 Do not walked directly to the Petronas Petrol station as it is fenced. The easiest way to walk was from the entrance and exit point for vehicles at the airport, the Petronas Petrol station is on the right. Over at this Petronas petrol station, there were a couple of Blue Bird taxis which runs by meter parked there. However, if you are carrying heavy luggage or with children; it is advisable not to walk to the Petronas petrol station as the traffic in Medan is notorious. For myself, I choose to pay at the taxi counter Rp 55,000 and board a designated taxi. The reason is that the savings of only Rp25,000 if I do not used the taxi at the airport was not worth the time, effort and risk. Besides, when you use a meter taxi, the taxi driver could easily bring you in a merry go round just to cloak the meter higher. This is the Petronas petrol station which is just outside the airport. If you want to save money by not taking the taxi from the airport, just walked to this petrol station and you can board a Blue Bird taxi over there. For departure from the Bandara Polonia Medan, just inform the taxi driver whether you are going for international or their local domestic flight. The cab driver would then drive you to the correct gate. For international, it is Gate 1 if I can recalled correctly. It is advisable to check in early as the departure hall is again basic and messy. Again there would be a few people approaching you asking to see your passport – do not hand it over to them. There was a guy who was persistence in asking me details about my destination. I simply ignored him then he walked away reluctantly. Do not give money to anyone in assisting you to pay the airport tax. I sat at the departure hall for an hour, as I was early and the booth for Valuair was not opened yet. The touts are those guys from the counter that provide the service that laminates and secure luggage. During the one hour sitting at the departure hall, I saw 2 guys from the same counter that secures luggage harassing passengers. I saw vulnerable passengers handling cash and passports to them. I do hope that the Medan airport officials would kicked out these touts from the departure hall if they are serious about promoting Medan as a tourist destination. 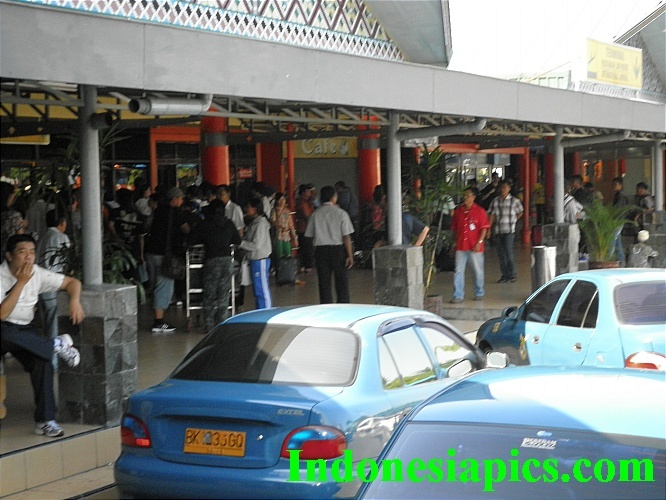 Outside the arrival hall of the Polonia Medan Airport. There are many touts out here, just ignore them. Taking a taxi from the airport is more costly, but it is relatively safe. Just book a taxi from the taxi counter. 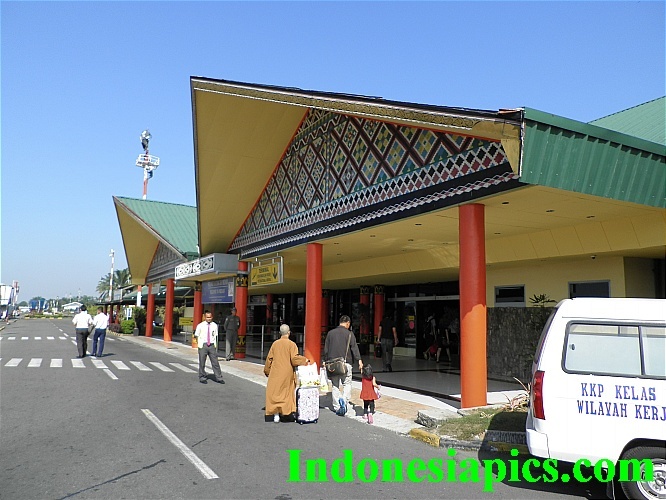 Airport tax for international departure from the Polonia Airport in Medan is Rp75,000. Go to the check in counter first to get your boarding pass and check in your luggage. Thereafter, turn around and there is a small counter opposite the rows of airlines check in counter. Walk to the counter and you can see a notice been pasted on the window of the counter – that it is an counter for airport tax and the tax rate that you have to pay for International and domestic flight. Just queue up at the counter and when it is your turn, hand over your travel document and money to the staff. The counter staff would paste a airport tax sticker at the back of your boarding pass and hand back the travel documents back to you. After this, you are good to go – just need to clear the immigration and customs and later wait at the departure waiting area for your flight. The Medan city center from the Polonia Airport Medan is just about 15 minutes away. However the notorious traffic jam on the road is what makes a simple trip becoming a time consuming journey. 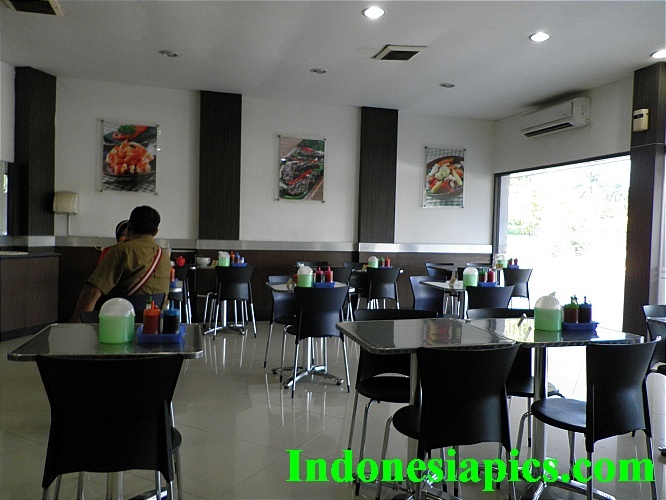 One of the small cafe in the Bandara Polonia Medan that served hot meals and drinks. It is a nice place to relax and have a cold drink – as Medan is a very hot and dusty city. 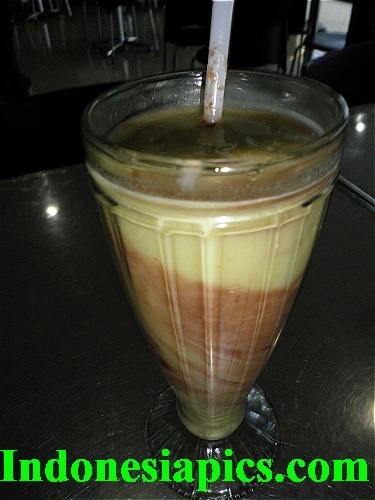 This is the Apokat drink or avocado with chocolate drink which I ordered at the cafe at the Polonia Airport Medan.